WASHINGTON — The Boy Scouts of America (BSA) has announced that it will implement its new policy allowing openly homosexual youth to serve as members beginning on January 1st. A number of Christian organizations then predicted a significant exodus from the Scouts as a result of the decision. Soon after, churches across the country announced that they were booting the Boy Scouts from their building to stay true to the Bible. 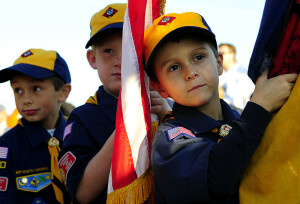 The Boy Scouts state, however, that they hope that the implementation of the new policy on January 1st will have no ramifications. “The Boy Scout Handbook continues to define ‘morally straight’ as ‘Your relationships with others should be honest and open. Respect and defend the rights of all people. Be clean in your speech and actions and faithful in your religious beliefs. Values you practice as a Scout will help you shape a life of virtue and self-reliance,” it outlines.